In the third game of the 2018 season, Mississippi State saw improvement in its downfield passing game, continued its defensive dominance, and moved its record to 3-0 on the season as they defeated Louisiana 56-10. The Bulldogs wore the same color combination as they did in the season opener: Maroon-Maroon-White. But this game came with a twist: Mississippi State wore matte maroon helmets for the first time since the 2015 season. Featuring silver facemasks, silver decals, and a single silver stripe, the new matte helmets look incredible. 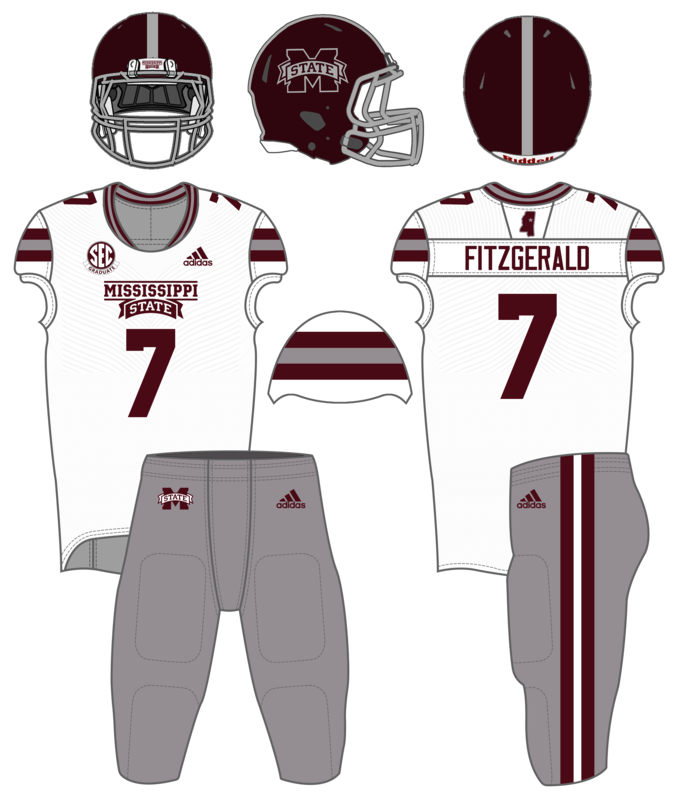 This is the 7th matte helmet design with the M-State logo that Mississippi State has worn, and 8th non-shiny maroon helmet design when you count the (technically satin) maroon helmets with a silver bulldog worn in 2013. Mississippi State first wore matte maroon helmets in 2011, and wore them four times a year each year through 2015. In 2016, they were replaced by silver helmets that were worn 6 times throughout 2016 and 2017. Now in 2018, the silver helmets are out and matte maroon is back in! Despite all of that, I thought the combination still looked pretty good on the field. It was a good matchup with the Ragin Cajuns, who have some of the best uniforms among group of 5 teams. The silver facemasks on State's helmets matched up well Louisiana's chrome facemasks, and the Ragin Cajun's sleeve and pants stripes complimented the similar ones on State's uniforms. On the back of their helmets on Saturday, Mississippi State wore stickers honoring Alex Wilcox, a Mississippi State softball player who passed away from ovarian cancer earlier this year. The sticker design was really well done, merging the #8 (Wilcox's softball number) and a teal ribbon design. Really touching tribute. This week's uni model is Nick Fitzgerald, who looked incredible throwing the football on Saturday. Fitzgerald completed 14/21 passes for a 66.7% completion percentage, throwing 2 touchdowns and 0 interceptions, in addition to rushing for 4 touchdowns. Next week, the Bulldogs begin SEC play as they head to Kentucky. Would love to see the new matte helmets make their road debut; we'll see whether or not that comes to fruition.